The NYPD released some interesting, although rather upsetting news on Friday. 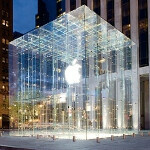 It seems that as of last Sunday, Big Apple thefts of Apple iPhones, Apple iPads and other iDevices added up to 15,627. That figure was up 3,890 over last year's numbers for a gain of 33% year-over-year. Amazingly enough, there were so many crimes involving the theft of an Apple iPhone or iPad that removing them from the stats would show crime down in NYC for 2012. In fact, there were 3,484 more crimes committed in New York City during 2012 than in 2011. 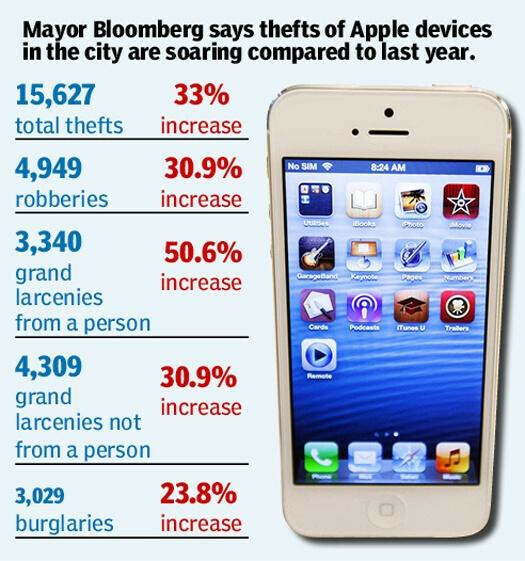 If the same number of Apple iDevices that were stolen last year, 11,737, were stolen this year, the tabloids would be talking about a safer New York in massive type on their front pages. Mayor Bloomberg told Apple owners to be careful with their devices and even gave a helpful hint to try to prevent them from becoming a statistic. He suggested that Apple iPhone users refrain from putting the smartphone in a pocket. He said, "Don’t put it in a pocket where it’s easy to take out of your pocket without you noticing it." Units taken from an owner's pockets and possessions shot up 50% this year from 2,218 stolen last year to 3,340 this year. More ominous was the increase in the number of Apple iPhone and Apple iPad units taken by force or threat from 3,781 to 4,949 this year. That is a 31% gain in robberies and was matched by the 31% gain in the number of the devices that were purloined, or taken from a desk. Burglaries involving the Apple devices were up 24% to 3,029. The NYPD told owners of Apple devices that they should have them registered with the police. Precincts have engraving tools ready to help add serial numbers to the products making them harder to fence and easier to return to their rightful owners. The cops added that Apple models are targeted because of the heavy demand for the Apple iPhone and Apple iPad in the marketplace. On September 21st of this year, when the Apple iPhone 5 launched in the States, New York Police sent people out to six Apple Stores to tell prospective iPhone owners that if they buy the phone, they should install the "Find My iPhone" app which would allow them to track their missing device. Thank you thieves for shortening the suffering. scraping the bottom for interesting news......... :-( ...just a few more days 'til CES 2013 - now that's HiTECH CANDYYYYY!!!....aaaargh! This is awful! I hate thieves! What I hate even more are fanboys! Why would anyone cheer someone getting beaten and robbed for their possessions? Don't you think the suffering of a beatdown and someone taking your hard earned stuff is worse than owning an Apple product? I know, I can't convince anyone to stop being a fanboy, but this Apple vs. Android stuff is getting out of hand. Yes I own a Nexus 4 and Nexus 7 and love Android. No I don't badger and humiliate people that own other ecosystems. Dont u remember when i$heep say that ppl buy android bcoz they cant afford is**t iProducts. When a lot can. So they deserve to be stolen. Actually they get stolen twice first when they buy any of is**t and then when a small thief steal their iAwesome iDevice. Well the lesson is don't buy apple trinkets and damn sure don't walk around showing them off, as iFans are wont to do. "OOOH look at me everyone, I have an IPHONE aren't I important! Just like every other teenage girl and housewife that has one!" Why would anyone steal an Android device when everyone and their moms are handing them out for free? They have no resale value compared to iOS devices. Truth hurts doesn't it? As far as I recall iphones can also be free of any cost. And if everybody is handing out android phones for free how come they don't have resale value? If you paid nothing and got some money back isn't it better that paying a lot and getting some back? So, tell me, truth hurts doesn't it? So in other words, you don't know what resale value means. Piss off. How you arrived at that conclusion I neither know nor care. Resale value is irrelevant to me, buying a $200-$700 device every couple years is not a big deal at all to anyone with a halfway decent job. Your poverty job does not change androids resale value. Make less sense and infer more, retard. My job is great and the point, which you completely missed, was $700 every couple years is affordable for anyone with even a crappy job who knows how to budget. Could you be more dense? LMAO @ stealing iNovelties. Literally could not give me one. I am ashamed to consider myself someone interested in all things cell phone when I see comments like this. These people were robbed; some at gun point, some after physical force. Nobody gives a damn if you like android. The point it if you own a smartphone; specifically an Iphone due to it having much better resale value then keep it safe, and that you should have the knowledge that it's a high target. As far as this stupid android vs iphone debate..everyone has their tastes..I like BOTH because BOTH are incredible devices in their own ways. Fact of the matter though is Apple products are more valuable in terms of MONEY. No where in the article does it mention the reason so many thefts are because of a "much better resale 'value'", so the thefts have nothing to do with that. It's because people can easily be duped into buying it...just like they are the first time someone buys an idevice...chalk it up to marketing and nothing else. Again, it is not 'value', it's simply popularity, big difference. Are you kidding me? Do you think people who steal target something due it not specifically having great resale value? Even then just look on ebay/craigslist etc..hell even best buy's buy back program! Apple iphones and ipads have WAYYYY better resale value. It's not even close. Know why? More people want iphones and ipads. Simple business. And how are they "duped" into buying it..if they were "duped" they would buy one..learn their lesson..buy something else the next time. Many MANY people prefer iphones over any android phone. Mcdonalds also sells the most burgers. What is your point? If this was a comparison of android vs ios your reply would make sense but it isn't. The iphone which is a single phone sells better than any one android phone; therefore it is the more popular phone and has a higher resale/street value. Look at the Mayor's statement: "But if you took out thefts of Apple products — not Galaxies, Samsungs — just Apple products, our total crime rate would be lower than it was last year. "-Mayor Michael Bloomberg, New York City" Did it really need to mention Galaxies, Samsungs when Apple products is clearly mentioned at start of sentence or he is just clarifying it for those who think Apple means Samsung? This to an educated byestander means nothing but a sponsored "Propaganda" for and on behalf of Apple involving the law enforcement agencies also. Reasons -- Apple products does not include Galaxies and every educated person buying devices /gadgets knows that so why should a Mayor be working as Apple's PR guy directly/indirectly?